I am an OFSTED REGISTERED childminder and I live with my husband and 3 beautiful children in South Croydon. 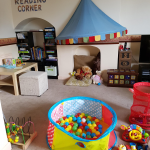 I have been working as a teaching assistant for years and decided to start my own childminding setting which i am really enjoying. I am an Ofsted registered childminder with 6 years of experience. I aim to have a safe environment for the children in my setting so that they could feel comfortable and learn to become happy and confident individuals. I am DBS checked and have also completed my First Aid course. I do have a car and can pick and drop from school and after school clubs.Currently pick and drop from Ridgeway Primary School. I work from 8am -6 pm Monday to Friday. Below are the latest reviews for Happy Ducklings. Please note that reviews represent the subjective opinions of other Childcare.co.uk users and not of Childcare.co.uk. Parents must carry out their own checks and references on childcare providers to ensure that they are completely happy before enaging in the use of their services. Zainab was very professional and put all my worries to rest when we needed emergency childcare with our regular Nanny having a baby. All the kids there seemed happy, comfortable and always playing when I got in to pick my baby. Thanks Again Zainab for taking us on at such short notice and for the care you gave Isabella. Will highly recommend and contact you if the need ever arises! Fun, Reliable and very accommodating!! I know Zainab when she took art classes for kids and my daughter enjoyed it a lot. When I found Zainab on this website as a registered Childminder I didn't hesitate to contact her as I knew my daughter will be in safe hands. Zainab has been Ishanvi's Childminder for past one year now and I am pretty confident we will be using her services for a long time. Zainab provides excellent childcare. She is reliable, fun loving and hard working. She has always bought a professional, thoughtful, organised and expert approach to the care of my child. Her home is always welcoming and clean, and her home-cooked meals as my daughter describes are delicious! She is extremely accommodating, especially with my long working hours, she even helps with home pick up /drop off and at times even looked after my sick child when I was urgently needed at work which is added advantage for working parents like myself. She plans various fun activities and day outing with the kids over school holidays. My 8 months old baby has been going to Zainab for the last 6 weeks and has settled very quickly to Zainab's homely and warm environment. Zainab provides daily reviews of his activity which I find very helpful and communicates promptly any queries and issues. It is very evident that Zainab is an experienced childminder and knows how to mind for babies as per their needs. I am very happy that she was also able to accommodate my baby at short notice. My son has been going to Zainab for over 6 months now and I am very pleased with how well he has settled in and how comfortable he is with her. Zainab is very caring and looks after him very well. She helps with finding his lost stuff from school and conveys any messages to and from the teachers. He is really happy when he is there and I am extremely reassured and pleased with that. I am very pleased with the service I have received from Zainab. She is an exceptional childminder. My 3 year old daughter felt extremely comfortable in Zainab's house very quickly. Normally my daughter is very shy and very quiet at nursery & adults but with Zainab it was different. my daughter looked forward to playing with Zainab and absolutely loved the arts and crafts activities they did. To my surprise, when I picked up my daughter, at times she refused to come home with me and wanted to stay at Zainab's house! On many occasions, my daughter even asked me to invite Zainab to our house to play. To me, this demonstrates that Zainab is very attentive to my child, very caring and knows how to build a relationship with children. I also liked that Zainab will spend the time to communicate with me about my daughter has been and what she ate. I would definitely recommend her childminding services.